GSM Archives - Write for Wine: It's Wine O'Clock Somewhere!Write for Wine: It's Wine O'Clock Somewhere! Summer time, and the living is easy. We have tasted some excellent good-value reds recently, so bring out the wine glasses and start up the BBQ! 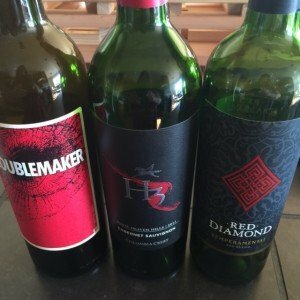 Troublemaker comes from Hope Family Wines, a pioneer in Paso Robles wine country — established 30 years ago and still family-owned and operated. Troublemaker is a Rhone-style blend that is distinctly Paso: 46% Syrah, 25% Zinfandel, 14% Grenache, 10% Mourvedre and 5% Petite Sirah. Think of it as GSM with a kick. Most of the wine comes from the 2013 vintage, but a mix of 2012 and 2011 brings a multi-vintage complexity that is unique. Fruit-forward characteristics make it pop; we’d say it’s trouble in glass! This is one enjoyable, good value Cabernet Sauvignon from Columbia Crest, bursting with flavor! Think bold — 99% Cab Sauv with 1% Cab Franc to round off the edges. 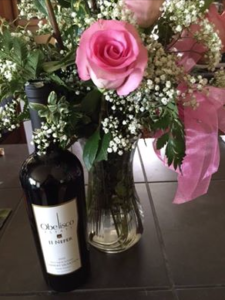 This wine is ready to drink now, with flavors of cherries and blackberries and soft tannins. H3 will pair well with any kind of beef, lamb or your favorite strong cheese. And at $15, you can’t beat it for summer parties and barbecues. Red Diamond recently released new packaging with an eye-catching label, in addition to several food-friendly wines at the low price of $10. So far, we’ve just tasted the Temperamental, a rich blend of grapes sourced in Spain — Tempranillo (90%), Graciano (4%), Garnacha (3%) and Mazuelo (3%). With flavors of black fruit and berries, this isn’t a typical dry Spanish wine. We found it jammy, even semi-sweet, with a smooth finish. Pair it with BBQ steak or lamb. All three wines were sent to us as samples for tasting. We recently had the opportunity to taste wine described as “hidden gems” from Walla Walla: Mackey Vineyards 2009 Syrah ($32), 2009 Cabernet Sauvignon ($32) and 2009 Concordia ($38). We give a thumbs up to all three. 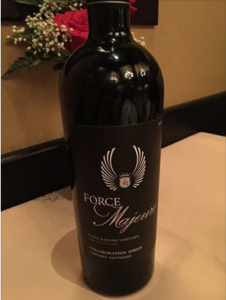 Mackey Vineyards was launched in 2010 by Philip and Roger Mackey, who collaborated with winemaker Billo Naravane of Rasa Vineyards. Although gaining some local acclaim, the portfolio is not very well known across the state. As a result, Write for Wine received these samples to taste – and we are glad. This wine manages to pack a wallop, while being silky and elegant at the same time. Big and beautiful, this Syrah has a lovely nose with aromas of blackberry, vanilla and minerals, and is full of flavors of spice, black pepper and smoked meat — a showcase of the way this grape is crafted in Washington state. We enjoyed it with Dave’s amazing spaghetti, but this robust wine would also go well with grilled meats, game, beef stew and meat lover’s pizza. This Mackey Syrah is strong enough to simply pair with some tasty cheese, too – a mild but smokey blue cheese or a white cheddar. This deep, dark red wine is a Rhone blend of 77.4% Syrah, 12.9% Grenache, and 9.7% Mourvedre. In some circles, this big, peppery combination is known as GSM. Frankly, unlike many of our friends and colleagues, we are not big fans of Mouvedre or Grenache as stand-alone wines; there are many good ones in Washington state, but they aren’t to our palates. So we were always hesitant to taste a wine that blends those two grapes with Syrah. That is, until about a year ago, when Seven of Hearts in Carlton, Oregon encouraged us to stretch our palates and wowed us with their version. Thanks to Seven of Hearts, we decided to try again with this Concordia, and we loved it. The 2009 Mackey Vineyards Concordia showcases flavors of white pepper, black fruits, dark chocolate and vanilla. Mackey describes it as complex and decadent, and we agree. Our palates favor Bordeaux-style wines, so how could we not enjoy a Cabernet Sauvignon that is rounded off with 15.8% Cabernet Franc and 5.3% Petit Verdot? This wine features a silky texture and good complexity, and we both talked about how it is a good every day wine to pair with some of our favorite home-cooked meals. But notably, we both also think it will age to become a special-occasion wine, if we cellar it for 5-8 years. In other words, it definitely is drinkable now, but has the potential to be be really powerful a few years down the road. 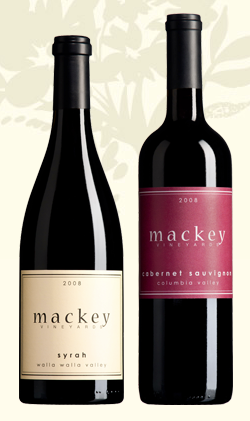 By the way, both the 2009 Mackey Vineyards Cab Sauv and Syrah won a gold at the 2012 Seattle Wine Awards and silver at the 2013 Tri-Cities Wine Festival last month. The 2009 Concordia received 92 points from The Wine Advocate and Wine Enthusiast, and 91 points from Wine Spectator. Give all three a try and let us know what you think!